Star Wars fans eager for more after The Last Jedi won't have to wait a full year until the next film. It's only five months until Solo: A Star Wars Story arrives, and so we should probably expect a legit marketing campaign to start soon, perhaps with a trailer? 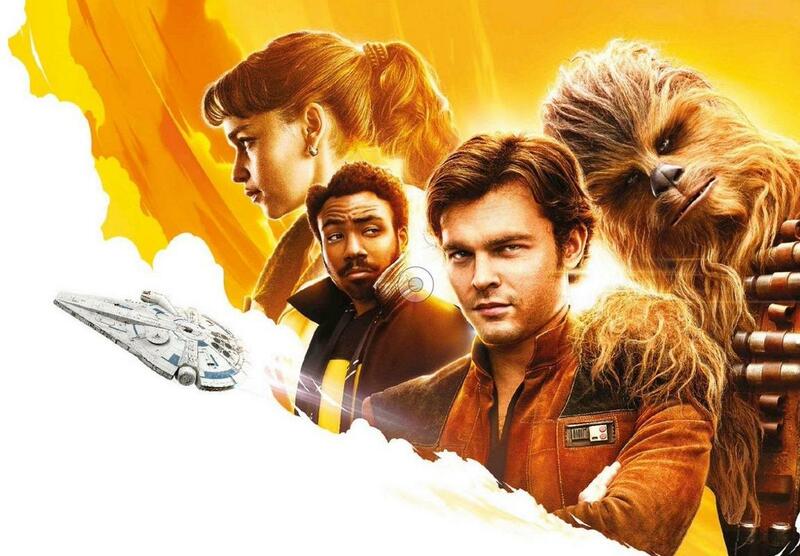 But for now, these leaked images from a Russian site (via CBM) will have to suffice in giving us our best look at young Han Solo and Lando Calrissian. The image features Alden Ehrenreich as Solo, Donald Glover with an interesting 'cut as Lando, plus Chewbacca and Emilia Clarke as a character we know as Kira. And of course, there's the Millennium Falcon, which probably is still owned by Lando at this point, until he loses it to Solo in a game of Corellian Spike. The production has recovered under the guidance of director Ron Howard, who came in after the creative turmoil that shook loose Phil Lord and Chris Miller. He'll be in charge of bringing to the big screen some of Solo's most iconic moments, like winning the Falcon, his first encounter with Chewbacca, and the infamous Kessel Run. Solo: A Star Wars Story opens May 25th 2018.